Benghazi hearing: Gregory Hicks says "stand down" order is true. 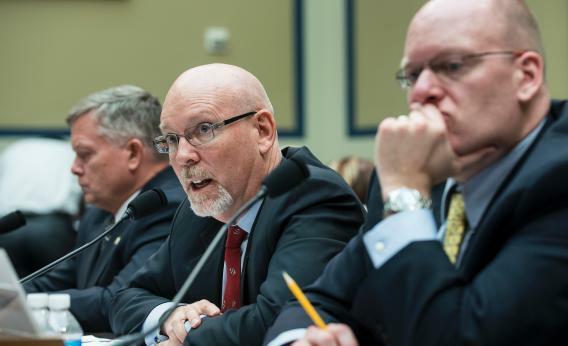 There’s no doubt the testimony in today’s hearing on the Benghazi attack was riveting and emotional—two of the three witnesses choked up during their testimony while talking about the four embassy employees who were killed the night of Sept. 11, 2012. But aside from the timeline of events (which was fascinating to hear firsthand—more on that later) it revealed little new information about the State Department’s supposed culpability in mishandling the attack. Here’s what I found was the most interesting exchange from the hearing: Rep. Mike Turner (R-OH) prodded the witness Gregory Hicks, the former Deputy Chief of Mission in Libya, about the State Department’s “stand down” order. That’s the allegation that State told a Special Forces team based in Tripoli to not fly to Benghazi to help evacuate embassy personnel there. The thing is, none of the witnesses actually uttered the magic words “stand down” in their testimony (as far as I heard), so there is some news in that Hicks is now basically saying the Pentagon lied. On Tuesday, Firman said the military is trying to assess the incident Hicks is referring to, but the aircraft in question wound up evacuating a second wave of Americans from Benghazi to Tripoli, not transporting rescuers to a firefight. Turner: Now, do you know why they were told to stand down? Did Colonel Gibson give you any information or understanding? Hicks: I actually don’t know why. Turner: Is there any reason to believe that the situation in Benghazi was over? There were a number of series of attacks, as you’ve described it to us. Any reason to describe that there was no longer any danger in Benghazi? Hicks: No, it was every reason to continue to believe that our personnel were in danger. Turner: Mr. Hicks, Mr. Chaffetz has given me an article that appeared in USA Today just this week. And just as early as last Monday, Major Robert Firman, a Pentagon spokesman, said that the military’s account that was first issued weeks after the attacks hasn’t changed. “There was never any kind of stand-down order to anybody.” Now, that’s a pretty broad statement, “anybody.” What’s your reaction to the quote by Mr. Firman? Hicks: I can only again repeat that Lieutenant Colonel Gibson said he was not to proceed to board the airplane. Turner: So your first-hand experience being on the site, standing next to Colonel Gibson, who was on his way on that C-130 transport and being told not to go, contradicts what Mr. Firman is saying on behalf of the Pentagon? Later, Rep. Ron DeSantis (R-FL) asked Hicks who gave Lt. Col. Gibson the “stand-down” order. “He did not identify the person,” Hicks said. And therein lies you know what.